Retail, Restaurants, Creative, Fashion, and Arts. 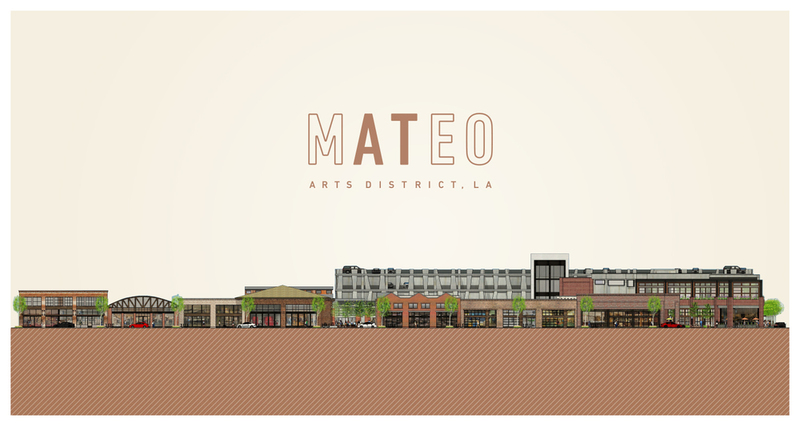 Upon its completion and opening in early 2018 AT MATEO will become the only critical mass and retail driven project in the entire Arts District. Encompassing approximately 130,000 square feet of first tier restaurants, boutiques and local services, approximately 50,000 square feet of modern, creative office space, and 540 covered and well-lit parking spaces, AT MATEO has been designed to become the epicenter of social activity for neighborhood. AT MATEO will be activated from breakfast to nightcap, seven days a week. Blatteis & Schnur traces its roots back to 1922 when the company was co-founded by Samuel Blatteis as what is believed to be the first real estate firm in the Western United States to make a specialty of retail leasing and brokerage. Blatteis & Schnur’s principal business specializes in the acquisition of 100% High Street properties in the top 20 urban retail markets in the United States. The firm has consummated over 40 transactions of premiere properties over the past 15 years in such diverse markets as Beverly Drive in Beverly Hills, Malibu, Union Square in San Francisco, Michigan Avenue and Lincoln Park in Chicago, Walnut Street in City Center Philadelphia and Maui, Hawaii. For more information, please visit our website at www.blatteisschnur.com. ASB Real Estate Investments (ASB), a division of ASB Capital Management, LLC, is a leading U.S. real estate investment management firm, managing $5.4 billion* in gross assets under management for 300 institutional clients. Headquartered in Washington DC, ASB invests in major urban markets across the country, concentrating in office, multifamily, retail and industrial properties. ASB manages the ASB Allegiance Real Estate Fund, its sole vehicle for core investing, as well as the ASB Meridian Real Estate Fund, a low-leverage opportunistic vehicle, and a development separate account. For more information about the company, visit www.asbrealestate.com.